Cape Town - The Springboks will take on Wales in Cardiff on Saturday without a number of key players. 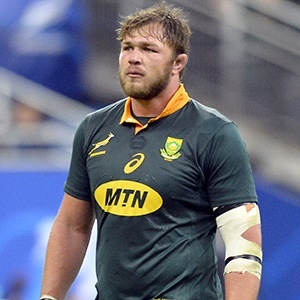 As the Test falls outside the international window, Francois Louw, Franco Mostert and Duane Vermeulen will return to their respective clubs and are not available for selection. Mostert has mostly featured off the bench for the Boks while Louw and Vermeulen have played a crucial role in wins over France and Italy. Siya Kolisi will return to the squad following the birth of his second child while Japan-based Elton Jantjies will remain with the team. Kolilsi will in all probabilty slot into the openside flanker berth of Louw while Springbok coach Allister Coetzee will have to decided who will play at No 8. In other injury related news, Tendai Mtawarira sustained a groin injury in the first half against Italy and a call on his availability will be made later in the week. The Springboks will travel to Cardiff on Sunday, where they will prepare themselves for their last Test of the Outgoing Tour at the Principality Stadium.